Lynn Miller is a certified Music Therapist with a masters degree in Expressive Arts Therapy. 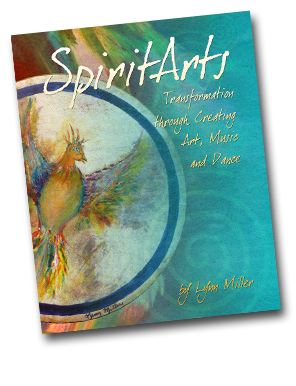 She holds a private practice at the Healing Arts Studio in Phoenixville, PA.
Lynn is the author of, SpiritArts, Transformation through Movement, Creating Art & Making Music, which is a culmination of her experiences in Arts and Healing. 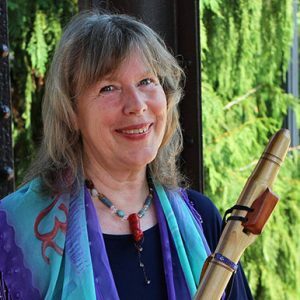 Lynn is on staff with Flute Haven Native Flute School. She teaches improvisation, performance and singing skills. She also teaches for the music facilitation certificate program. Lynn has been adjunct faculty in Music Therapy at Immaculata University and a facilitator for Music for People for 18 years. She created a Creative Arts therapy program at Roxborough Hospital in Philadelphia, PA where she worked as a music therapist. Lynn also painted 12 murals for the hospital with her colleague Liz McIllvaine. Lynn has certificates in Reiki, the 12 Stages of Healing, and Chakra Clearing with Applied Integration. She also has certificates in Sound healing through Joy Gardners Vibrational Medicine training and Don Campbells Therapeutic Sound School. 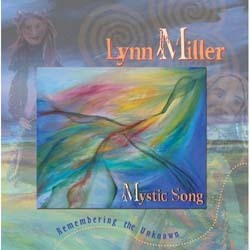 Musically Lynn has a background in jazz, folk and world music. She performs with the bands Spiritgrass and Mystic Song. She has performed at the Kimmel Center, Philadelphia Museum of Art and the Open Air Festival in Switzerland. Lynn is a visual artist that works in most art forms: painting, sculpture, stained glass, mosaics, paper mache, dollmaking, puppets and printmaking. She has shown in galleries as well as taught art in schools and art centers. She has utilized her visual art skills in community art projects. Lynn conducts workshops for finding your inner artist or musician in the US and throughout Europe. Home and abroad, she builds community through community arts programs such as: singing workshops, coordinates community-built murals and arts parks, facilitates Giant Puppet builds and parades and creates rituals for communities through the arts. Lynn has conducted workshops at retreat centers such as the Omega Institute, Trimurti in France, Kientelerhoff in Switzerland and Ompio in Italy. She has made Music therapy presentations in India and for the American Music Therapy Association. She has performed and made presentations for the NJ Social Workers conference and the Interdisciplinary Society for Quantatative Research in Music and Medicine and was a keynote for the Music for Healing and Transition Conference.